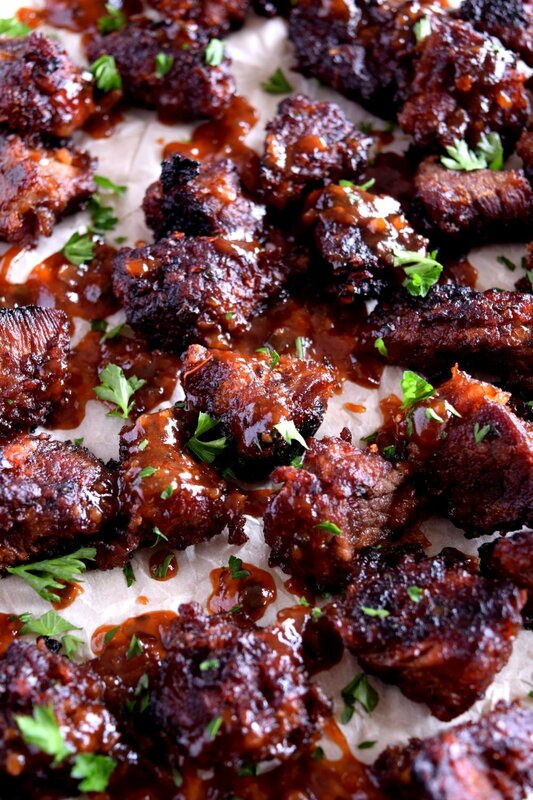 These bites are simple to make and smothered in a deliciously sweet, spicy, thick, homemade BBQ sauce. Forget the game, you are the winner already! Combine the salt, onion powder, ketchup, lemon juice, ground mustard, Worcestershire sauce, brown sugar, black pepper, vinegar, water, cayenne pepper and chili flakes to a sauce pan. Mix well so all ingredients are combined. Turn the heat on your side burner to a medium to low heat and stir until the sauce begins to boil. Once boiling turn the heat down to low and leave to simmer for about 20 minutes stirring occasionally. Once the sauce is thick it is ready to go, take it off the heat to prevent it from burning. This sauce is so amazing a versatile, it works really well with chicken, pork, vegetables or even as a dipping sauce. Make an extra batch, it will store in the fridge for 1-2 weeks easily! While the sauce is cooking combine the beef, corn starch and salt in a large bowl. Toss to make sure all the beef is well covered. Prepare your Mont Alpi for indirect cooking. Turn on the outside burners and leave the center burner off. Place your griddle plate onto one of the outside burner. Add oil and sear the beef cubes for 3-4 minutes each side. Once all the beef is seared put it in the BBQ sauce you have made to fully coat each piece. Take the meat out of the sauce and place on the center burner of your Mont Alpi. Close the hood and leave to cook indirectly for 25 minutes. Once cooked remove the beef from the BBQ and plate. Pour the rest of your sauce over the top and garnish with parsley. You are ready to serve and enjoy!